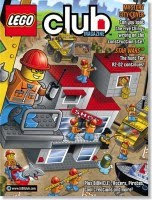 A Resourceful Home .com: Free Subscription to Lego Magazine! Here's a fun freebie if you have kiddos or are just a kid at heart. Click here to sign up for a free 2 year subscription to Lego Magazine. We just graduated my oldest daughter from Duplos to "real" Legos this Christmas, so I'm looking forward to exploring what this magazine has to offer with her. A big thank you to Rachel at Surviving the Stores for this great post! The Lego magazine cover is sexist! Where are all the princess Legos??? That's what I want to know!! Anybody else do this one? I am so thankful to have seen this post! My son just yesterday was asking if I could get him a subscribtion to Lego mag! He is going to be one happy dude...thank you! Love the blog! Meredith, You're welcome! We got our first issue recently. Definitely more aimed at boys, so probably more useful for your son than our daughters (but still interesting to our girls).